Beginning in the early 1930s, Tom Lasater, the breed's founder, developed Beefmasters by crossing Hereford, Shorthorn and Brahman cattle. The exact mixture of the foundation cattle is not known, but is thought to be about 25% Hereford, 25% Shorthorn and 50% Brahman. Lasater's purpose was to develop cattle that would be more productive than existing breeds in the harsh environment of South Texas. The cattle were heavily selected on what has become known as the Six Essentials - Weight, Conformation, Milking Ability, Fertility, Hardiness and Disposition. No selection was made for characteristics that do not affect the carcass, such as horns, hide or color. These Six Essentials became the economic strength of Beefmasters and have made them favorites with ranchers who depend on cattle for a living. While brownish-red is the most common color, the breed has no color standards. 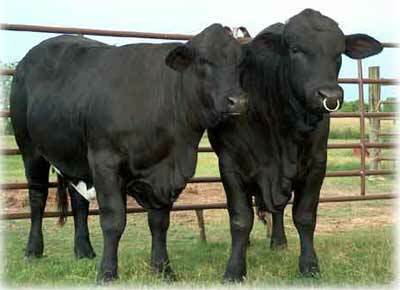 Beefmasters were recognized by the U.S. Department of Agriculture as a pure breed in 1954.